If you’re planning to travel during the upcoming holidays, get ready to wait in long lines, battle through crowded airports and possibly get delayed. According to NerdWallet, 20% of holiday flights from 25 of the busiest winter airports were either delayed or cancelled over the past five years. Unfortunately, you can’t do much about the inconvenience caused by a cancelled or delayed flight. 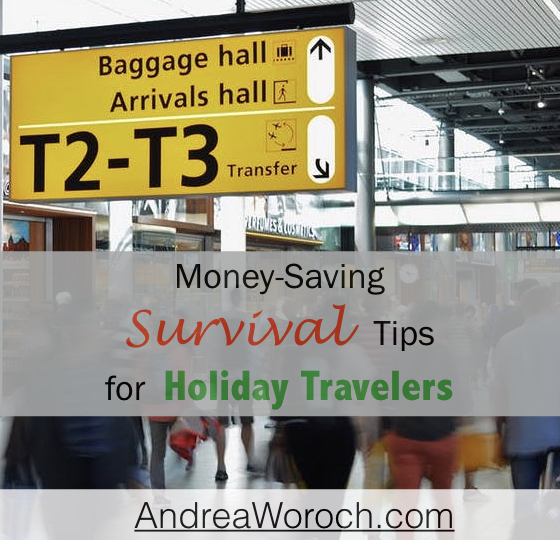 However, there are several measures you can take to make your holiday travel experience less expensive and less stressful. Budget for extra fees and consider alternatives. If you opt for cheaper airfare, you may be slapped with lots of additional fees, like checked baggage, priority boarding, seat selection and even carry-on luggage. Make sure to read the fine print and account for all the fees before booking. It’s possible flights that appear to be more expensive will save you money in the long run. Pack light when possible to avoid checked bag fees, order online and send gifts directly to your final destinations and bring a reusable water bottle as many airports have water filling stations to avoid buying bottled drinks. According to Colloquy, a loyalty intelligence consulting firm, $16 billion in rewards go unredeemed every year. These rewards aren’t just perks; you earn them as a result of your spending, so it’s wasteful not to use them! Redeem your credit card or airline miles for gift cards to help pay for your holiday travel, or figure out how to use miles for flights or even restaurant meals. You can also use apps like Swagbacks Local to earn points for dining and shopping which you can redeem for gift cards. Use discount gift cards and coupons. For dining, entertainment, airfare and hotels, you can save on your travel needs by using discount gift cards. Restaurant.com offers gift cards for 40-percent off face value to local eateries when you enter zip code. You can also enjoy that family holiday movie outing for less: Warehouse stores offer bundled gift card deals for movie theaters, like a 10-pack of tickets to Regal Cinemas for $84.99 (less than $8.50 per ticket!) from Costco. Use any leftovers as gifts! Look into daily deals for restaurants and movie theaters via Groupon or LivingSocial for 40 to over 60-percent off your dining experience. A unique way to save on hotel lodging is to buy a cancelled reservation. RoomerTravel.com connects you with other travelers who are stuck with a hotel reservation they can’t cancel, and facilitates your purchase of that reservation for up to 25 percent below market price. Enter the city or zip code where you’re visiting to look for available reservations. Research airport parking and transportation. AirportParkingReservations.com provides a current list of available parking lots and going rates helping you find more affordable long-term parking. You can read reviews to ensure a safe location. Also, don’t get stuck at the airport destination with no ride to your hotel or family’s home, or you could get stuck paying a premium for a cab service. Consider shuttle services or even seek car shares via Zimride. Get reimbursed for delays or cancellations. There’s nothing worse than finding out your flight is delayed or cancelled, but with AirHelp you might be able to receive some compensation for these issues to help lessen the blow to your budget. The service takes 25% of your haul if you are compensated, but nothing at all if your claim is rejected. Travelers have the potential to receive up to $800, so it’s worth a shot! A smartphone is a tool many travelers rely on for accessing driving directions, capturing memories, sharing updates with friends and family, and finding things to do and see along the way. All of these activities, however, will eat up your data and may cause you to pay pricey overage fees. Reduce data use by turning off app push notifications and stay connected on-the-go using the Free Wi-Fi Finder app. Monitor data usage with 3GWatchdog App and DataMan App to avoid overage penalties. Hi Andrea, I love your blog. Just wanted to follow up with you about this. I used some of your tips while shopping this holiday season and they worked out great for me! I purchased discounted gift cards from Gift Card Karma to save on my gifts, as well as used Swagbucks (which is my new obsession)! I love earning gift cards for shopping and eating out! Thanks again for these great tips! Dog owners are looking at dishing out around $2,500 on pet-related expenses the first year and another $500 each additional year. Find out how to give your pets the best care without blowing your budget. If you need a little budget boost, look around your home for saving opportunities. Not sure where to start? Check out Andrea’s recent segment for simple household hacks! Saving money isn’t easy, especially if you keep making these mistakes over and over again. Read this post to find out what you’re doing wrong and how to beef up your savings quickly.